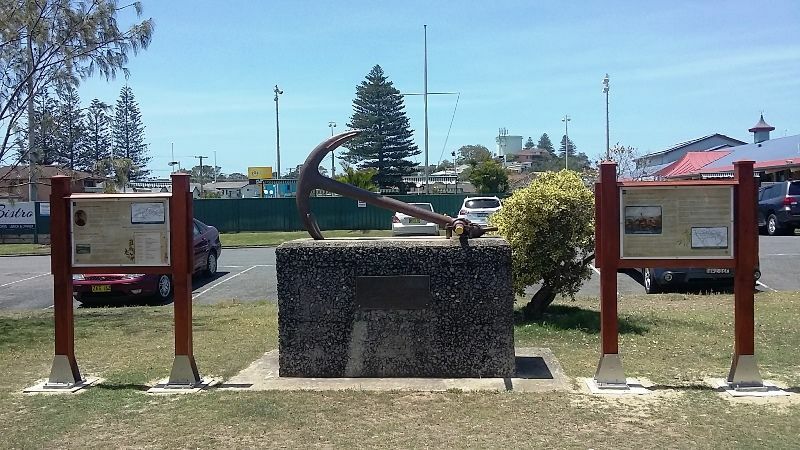 The monument was erected in honour of explorer John Oxley who explored the area from Bathurst to Port Macquarie. Oxley and his 15 men crossed the Manning River on the 22 October 1818 having stayed here from the 19 October. At the bicentenary celebration on Saturday 20th October 2018, two information boards were unveiled on either side of the memorial. The information boards tell a summary of both of his expeditions and his life to find the inland sea, how Harrington Village was started and the naming of the Manning River which Oxley called a Lake. The Oxley monument was unveiled on Saturday at Harrington, at the entrance of the Manning River. The inscription says:— "In honor of Oxley, who, in 1818, explored the country from Bathurst to Port Macquarie. During this expedition he discovered Liverpool Plains and ranges, the Peel River, Mount Severn, overlooking Port Macquarie, and the Manning River, which he crossed here on October 22, 1818." The commemoration tablet was donated by Mr. George S. Hill, of Bungay. This is embodied in a concrete structure rising about 5½ feet, surmounted by an anchor from H.M.S. Tomahawk. Mr. L. O. Martin, M.L.A., congratulated the originators of the movement for perpetuating the life of the first white man who had placed foot on Manning soil, Mr. Thomas Miles said that Oxley had shown a wonderful knowledge of Botany. His knowledge of hardwood timber was surprising. Richmond River Express and Casino Kyogle Advertiser (NSW), 19 September 1929. A flag raising ceremony at 8am on Saturday, October 20 in Harrington’s Pilot Hill will mark the start of the town’s celebration of the arrival of explorer John Oxley 200 years before. The ceremony will be followed by a street parade at 9.30 and a dedication ceremony at the John Oxley Memorial where two information boards will be unveiled. Harrington Public School students have been preparing for a re-enactment of John Oxley’s arrival to be performed at the memorial on Saturday at 11.30am, and a re-enactment of Oxley’s crossing of the Manning River on Monday, October 22 at 9.15am. A history display at Harrington Memorial Hall will be open 8.30am to 4.30pm on Saturday and 9am to 1pm on Sunday. Organised by Harrington Evening VIEW Club the display features the history of clubs, groups and families of Harrington. On Saturday night, Harrington Public School’s P and C is hosting a bush dance at Club Harrington and on Sunday, a church service will be held. Manning River Times, October 15, 2018.